The generated backups are configuration reports in HTML and are shown on the page Sample Configuration Reports. 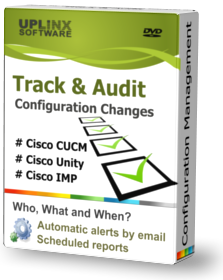 Cisco CUCM and Cisco CUC audit reports show who changed what and when. Cisco Audit logs can optionally be added to improve comparison reports. Without Cisco Audit logs, changes are still found and the time of change is evaluated from the last database change of this record.